Obituary for Robert Lee Nash Jr.
Mr. Robert Nash Jr., 97 of Forrest City, died on April 24th, 2017, at Forrest City Medical Center in Forrest City, AR. 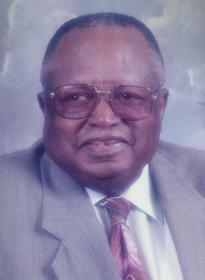 Mr. Robert was born December 9th, 1919 in Marianna, AR, to the late Mr. Robert Nash Sr. and the late Mrs. Betty Nash. Survivors are his brothers; Mr. Douglas Nash Milwaukee, WI and Mr. Urel Vertis Nash of Corpus Christi, TX; Grandchildren, Mr. Nathaniel (Lula) Kidd of Forrest City, AR, Mr. Grady (Gail) Kidd of Forrest City, AR, Mr. Jimmie (Catherine) Kidd of Forrest City, AR, Mr. Jerome Kidd of Forrest City, AR, Mr. Louis Turner Nash of Forrest City, AR, Mrs. Brenda (Edgar) Morris of Forrest City, AR, Ms. Linda Johnson of Forrest City, AR, and Ms. Kimberly Turner Nash of Forrest City, AR. Great Grandchildren 15, Great Great, Grandchildren 17, Great, Great, Great Grandchildren 1. The Funeral Service for Mr. Robert Nash will be at 2:00pm on Saturday, May 6, 2017 at Lane Chapel CME, Forrest City, AR. Interment will be in Shady Grove Cemetery, Arkansas. The family will receive friends from 1:00pm - 5:00pm on Friday, May 5, 2017, at CLAY FUNERAL HOME, 2522 East Broadway, Forrest City.